← Join Us For the Upcoming Food For All Conversation! Our raised bed hoop houses went up at Harper Acres just a few weeks ago. Our inspiration was based on an idea shared by Deb Habib from Seeds of Solidarity at our workshop in April. I collected the parts and the Harper Acres group decided how they wanted to put them together. The local hardware store helped me figure the lengths and parts that would best fit the project (potentially for one 6-ft. bed and one 10-ft. bed) : six 5-ft. lengths of flexible ½” poly-pipe, twelve 2-ft. long ½” rebar rods, and a couple of packages of white agricultural fabric. 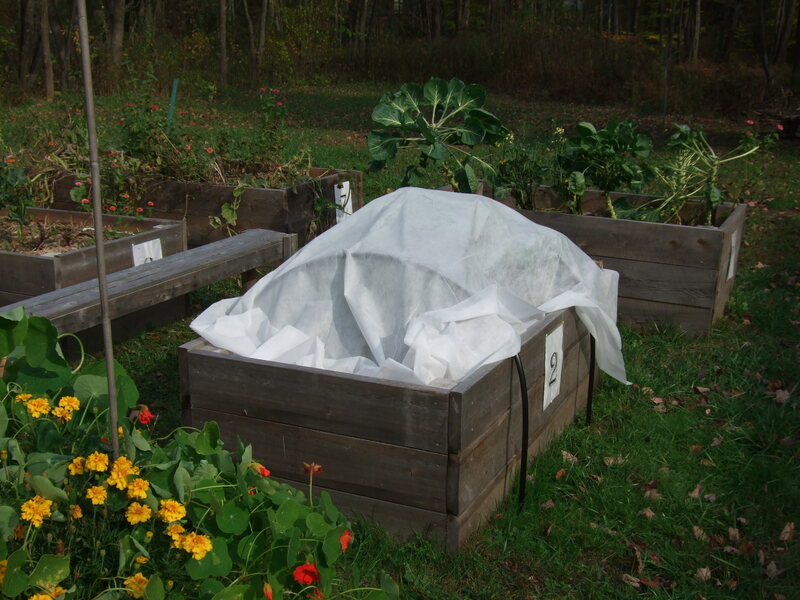 The group chose to only cover one 6-ft. bed and half of a 10-ft. bed to protect the last of our kale, rainbow chard, and carrots, as well as some turnips, beets, and lettuce we planted in late August. And they seem to be working! Everything looks green and beautiful, hardier than ever, surviving through these last few weeks of cold night-time temps. Yeah season extension! This entry was posted in Garden Resources, Harper Acres. Bookmark the permalink.